Renowned surfer Tommy Castleton, who’s been featured in surf movies and magazines all around the world, founded Maui Wave Riders in 1997. Having over 31 years of surfing experience and having surfed some of the largest waves at Pipeline on the North Shore of Oahu, Tommy has personally taught thousands how to surf in one easy lesson. They like to say they specialize in “Beginners and Cowards” and that gave me the push I needed to go and stand up on a wave, and what do you know? I did it! I had my first ever surf lesson and it was amazing! I ended up riding several waves! They definitely have the real deal – a bunch of guys taking business very seriously – but at the same time, having fun and loving what they do! They are so sure that they can teach you to stand up and ride a wave in one lesson, they promise: if you don’t ride a wave, you don’t pay for the lesson. So what do you have to lose? You’ll have fun, and you’ll ride a wave, or it’s free! They even take non-swimmers out. Tom and his Maui Wave Riders instructors have taught thousands of people to surf, from as young as 1 to as old as 81, no matter what size or shape. Both Maui Wave Rider’s locations are great for beginning, intermediate and advanced surfers. All instructors have CPR and First-Aid Training. Their surf spots are perfect for catching waves and seeing the occasional turtle or fish. Plus, after the lesson, the boards are yours for the rest of the day! 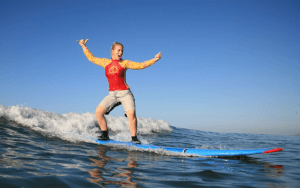 From beginners, cowards, and non-swimmers alike, everyone can learn to surf with Maui Wave Riders! Go to MauiWaveriders.com or call 808-875-4761 for reservations.